I'm not sure what I will write about, but I've been thinking about starting a blog for about two years now. I won't share everything (obviously) because once you put something out there you can never take it back - a lesson I'm sure many have learned the hard way. I'll make mistakes I'm sure, but not only would I not be human if I never made mistakes, but I wouldn't be showing my true self. I'll lead my first post with some back story behind my blog's title. As I mentioned, I've been thinking about starting a blog for about two years. Not wanting to start a blog for money, fame, or to influence people, I've instead wanted to start one to open up a place for me to write and others to read and comment on shared experiences. Some of these experiences are deeper than others. Sure I love going to the beach or lake; I got a job straight out of college and I managed to buy a house, car and get married all before I'm thirty But there's so much more to life. That's not what brings me (or anyone if they are being honest with themselves) true joy in life. -- I'm sure one day that will be a whole post in and of itself. So - going back to all the times I've thought about setting out and thinking about the reason I wanted to start a blog, the names I previously brainstormed never seemed appropriate for the "tag line" or purpose I feel like God is calling me to write about. I've written down titles such as "Insomnia Tales" or "Coffee with Grace," but neither really seemed right. Yes, I've had a sort of insomnia since as long as I can remember, but that's not what I want the blog to be about. I may write when I can't sleep, but I would like my readers to be able to wake up with a coffee and read what I, Grace, have to say. However, I'm not a big coffee drinker (and the domain name was taken), so I took that as my sign from God that it should be Lattes with Grace. Let me give you a quick back story to the meaning that "Lattes" have with me. When we were growing up, me and my siblings, my parents never let us have a dog - probably because we would forget to feed it! - so they let us (except the youngest who may have not even have been born yet) each get a hamster. Mine was brown and white, no particular pattern, was missing an eye, and had a bite mark on the opposite ear. I felt like I could really relate to him - he seemed perfect to me! I named him Latte. My favorite coffee drink to this day is a caramel latte. 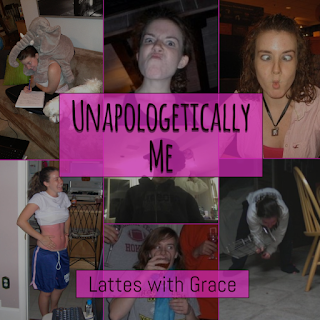 So, when "Coffee with Grace" was not available, Lattes with Grace was born. Thank you for reading! Leave a comment letting me know where you are from and what your week holds for you. -- Check back here for more about me, my hubby, my very sociable cat Daisy, and a lot about our goofy life.